“The best friendships can and will endure,” explains James Christensen. “My wife has a life-long friend that lives in California. We live in Utah. Their relationship is more like that of sisters, although possibly even stronger. They have been friends for decades. Over that period of time they have had the chance to share all the joys life has presented them. They have also looked to and supported each other through hardship, distance and change. Separately, they have grown but never have they grown apart. The physical distance between them is overcome by an unseen connection. 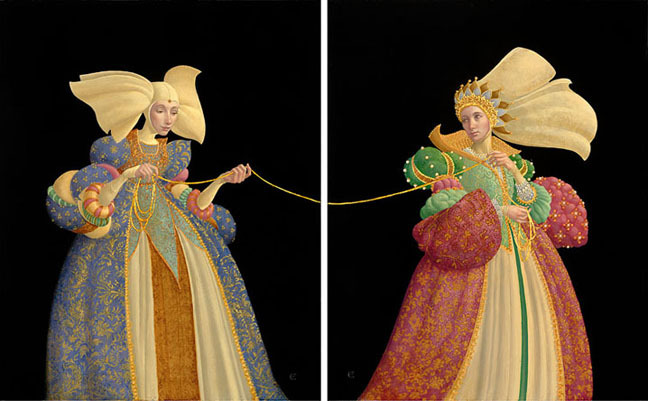 As with James Christensen’s original diptych, both Greenwich Workshop Fine Art Editions of The Tie That Binds are presented in two panels. One of artist’s ideas in creating the work was that each of the sister panels could reside in a separate residence, serving as a beautiful and thoughtful reminder of the relationship that makes this painting complete.